Rock ’n’ roll was flying in 1956 - the genre’s first film Rock Around The Clock appeared in cinemas, Elvis Presley’s debut album hit the shelves, Chuck Berry and Chess Records’ Rock, Rock, Rock! soundtrack was released, and a young John Lennon laid the foundations of The Beatles with his band The Quarrymen. Many years later and technology still allows us to hear these musical milestones… if only the same was true when it came to owning and playing the guitars! But until 3D printing grants us such wishes, the only way to experience the real thing is with a good, old-fashioned trip to the guitar shop. Plugging in a ’56 Goldtop is as close to walking in the shoes of Hubert Sumlin as you could possibly get (or those of Sister Rosetta Tharpe), or Bill Haley & His Comets’ lead guitarist Franny Beecher’s with a ’56 Les Paul Custom, or King of Rockabilly Carl Perkins’ with a ’56 ES-5 Switchmaster. Our imaginations may bring us close, but there really is no substitute. An extraordinary sight to behold in 2018, let alone in 1956, these instruments tell a story as Gibson continued to evolve their designs against the backdrop of rock ’n’ roll in a rapidly changing and increasingly competitive market. In 1957, the company began rolling out their PAF pickup across many designs, thus marking the end of the P-90’s reign. However, with the humbucker no longer de rigueur, many players - having discovered the diversity, subtlety and power of the P-90 - are increasingly returning to Gibson’s classic formative designs. During a recent visit to ATB Guitars’ newly opened showroom in Cheltenham, we discovered an exemplary selection of Gibson’s pre-PAF catalogue on display in the form of an ES-5N Switchmaster, Les Paul Custom, Les Paul Model and Les Paul TV. Epitomising a certain quality that has come to define Gibson over the years, these guitars represent a unique moment in time, never to be repeated. They are, for many, the pinnacle of guitar building in terms of materials and craftsmanship. “In my opinion, this was the time when Gibson got the Switchmaster, or the ES-5, just right,” says Mike Long, owner of ATB Guitars, referring to the unique combination of specs that existed within a very narrow window between 1955 and 1957. “This ’56 ES-5N Switchmaster has stunning flamed maple, a big, chunky neck and the three P-90s sound delicious. There is a volume and tone knob for each pickup and a four-way pickup selector switch [added in 1955, along with the ‘Switchmaster’ moniker]. The real magic occurs when you put the switch into the ‘all’ position - you get all three pickups at the same time and you can blend them with their individual volume and tone controls. You can instantly go from rhythm & blues to quack-y, honky-tonk to really mellow, soft jazz - the variety of sounds is pretty much endless. “A year later , when they brought out the PAF humbuckers, it didn’t seem to work quite so well. It was a bit too much for that type of guitar. It took away the jazz feeling and it swerved the guitar more towards a rock/country style. It became difficult to get the nice, mellow tones out of it. I think the combination of P-90s appears to work a lot more harmoniously with that guitar design. PAFs - particularly when they’re fitted to an ES-5 - sometimes feel like a caged animal that wants to be let loose - although that can work great on a Les Paul! Large neck profiles can often do wonders for a guitar’s natural, acoustic sound. “The neck is made of rock maple,” explains Mike, “and, acoustically, these guitars really sing. You can just mic them up [unplugged] and get some really great-sounding results. If you crank an Alnico V through a wound-up Marshall, it’s a killer combination. It’s a rock ’n’ roll machine! Top of Gibson’s Les Paul-endorsed solidbody electric guitar line was the Les Paul Custom, appearing in 1953. Now more commonly associated with hard rock, it was originally intended as a classy, clean-cut, upmarket instrument that wouldn’t look out of place when donning a tuxedo. Prior to Gibson’s Seth Lover-designed PAF watershed of 1957 - of which the Les Paul Custom received three - it sported the lesser-seen pickup pairing of a soapbar P-90 in the ‘lead’/bridge/back position coupled with an Alnico V (also designed by Seth Lover) in the ‘rhythm’/neck/front position. “The Alnico V could be found on other top-of-the-range guitars, like the L-5 and Super 400 electrics, but it’s certainly not on any other solidbody guitars,” Mike tells us. “It’s a superb combination with the P-90. Alnico Vs have a good amount of power, but you often have to wind the polepieces closer to the strings. I think the original intention was to have it quite low down, so that when you switched over to the rhythm pickup, you not only got a more mellow sound, but also a decrease in volume. 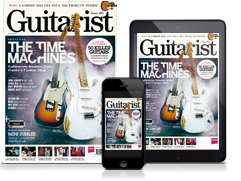 All guitar specs are, of course, a matter of taste, with the popularity of specific features waxing and waning over the years. Certain design characteristics that have long had their day, such as the chunky necks of the 50s, are often (re)discovered somewhere further down the line, while other features, originally deemed to be cutting edge, have virtually faded into obscurity. “The Les Paul Custom has the ‘fretless wonder’ frets,” says Mike, highlighting the early Les Paul Custom’s diminutive (and now rarely seen) fret wire. “Personally, I like them. If you get the guitar set up well and the truss rod adjusted correctly, so there’s no buzzing, it becomes extremely easy to play. Unlike the Les Paul Model/Standard and the late-60s single-cut Custom reissue, the 1950s Les Paul Custom was not fitted with a maple cap and has a solid mahogany body. Consequently, they are perceived by many to have an inherently darker acoustic tone, which, coupled with the absence of humbuckers in their early incarnation between 1953-1957, creates a wholly unique guitar. “The early Customs certainly have their own merits, but it’s hard to compare them to a three-pickup PAF version, or later, because they’re so fundamentally different,” advises Mike. “They are, maybe, slightly darker, and certainly the [late 60s] Les Paul Customs with the maple cap are noticeably brighter, but that may be the result of having different pickups. One thing’s for sure though - if you put a PAF Custom up against a ’Burst, it’ll give it a good run for its money! They all sound a bit different, but I wouldn’t say any one is necessarily better than the other. 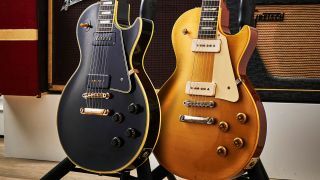 In the somewhat Darwinian spirit of competition, many of these evolutionary enhancements were prompted by the presence of Gibson’s newfound rivals, Fender. “By ’56 Fender were hitting pretty hard. They had both the Tele and the Strat, which were big sellers, and so Gibson had to up the ante and get their guitars into as good a shape as they possibly could,” says Mike. “Fender were starting to take a big part of their market and ’56 was a pivotal year in trying to combat their influence. In my opinion, it was the year of the best P-90-type guitars ever made. I think Gibson reached a certain pinnacle in ’56, because that’s when development stopped, and they concentrated on the humbucker route. “At that point, Gibson were well known for using high-quality Honduras mahogany with superb grain. It was about as good as it gets at the time, and it certainly made its mark on their instruments - it’s highly characteristic of their sound. They were also using high-quality Brazilian rosewood. They made guitars to a brilliant standard, and that goes right down to the lower end of their range, including the Juniors, such as this Les Paul TV. They were considered to be a starter package, yet Gibson used the same Honduras mahogany as the higher-end guitars and they didn’t vary their construction methods - they still had long-tenon neck joints and hand-carved neck profiles and were put together by real craftsman. You get variance and character with each one - every guitar is different. It was a wonderful time for guitar building. Guitarist would like to thank Mike Long of ATB Guitars in Cheltenham.